If you like the idea of Peanut Blossoms but want to make something more unusual, here’s a variation. 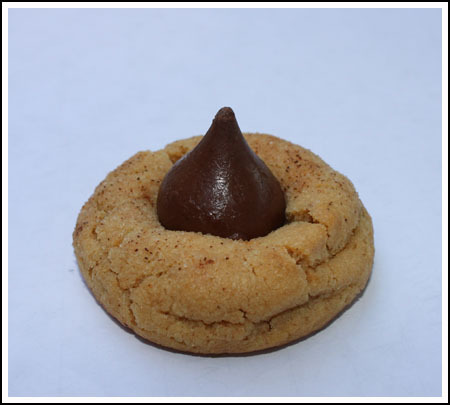 To make a Tex Mex Peanut Blossom, use your favorite Peanut Blossom recipe, but roll the dough balls in cinnamon sugar instead of regular sugar and use caramel filled Hershey’s Kisses instead of a plain milk chocolate Kisses. To take it a step further (and add a little heat! ), add about 1/2 teaspoon of ground chipotle to the dough recipe. If putting chipotle in peanut butter cookie dough sounds a too strange for your tastes, make a couple of test cookies by leaving the pepper out of the batter and incorporating a tiny pinch of it into a few balls. It’s a pretty good combo. Thanks for trying the chipotle powder version. I’m glad you liked it! You can use it in almost any peanut butter cookie recipe and it adds a little heat. Anna, I just tried this version, complete with chipotle powder and all, and they are amazing!! Such an interesting twist. I can’t wait to share them with others – thanks! Oh yes, I think I would love this version! Caramel, cinnamon and a little heat, nice! you could probably do a pb/chocolate cookie base to not lose the pb flavor. would be great to use dark chocolate kisses in this one! Therese, they do! Sometimes they’re hard to find, though. This time of year my grocery store sells all kinds of Kisses. Rhonda, the chipotle adds just a touch of heat at the end. The flavor is pretty subtle, though it does add some smokiness. If you have the chipotle powder on hand, you might want to try testing it out by adding a tiny pinch to a couple of dough balls. I love Mexican food but I think I will just stick with the original way to make these blossoms. Is this spicy way really good? you are a cookie expert! Hershey make dark chocolate kisses? I’ve had a dark chocolate brownie with some heat. Those were good too. Before I tried the Tex-Mex Chocolate cookies I would have shied away from these. Now I’ll be looking for an excuse to make them. I can’t wait!! Oooooo girl you are talking my foodie language!!! Nice! I’ll bet cinnamon added to these would be great. What a fun experiment with the four recipes too. I used to use one from my grandmother’s Joy of Cooking cookbook, the recipe didn’t call for eggs and it had the most intense peanut butter taste. Really good. But I lost the recipe long ago.